We use the word mostly in terms of politics, finance and, of course, aviation. Not many other fields of endeavour apparently experience such movement or confusion! However, it is the aviation-related turbulence that holds our attention today. I have recently been asked to comment on a turbulence event, experienced by one of the aircraft in the airline I fly for. As is usual with out-of-the ordinary flying encounters, social media immediately provided some passengers with a fleeting moment of fame. Words such as “I thought I was going to die”; the aircraft “going sideways”; and even people “getting up to open the emergency exits”….. the mind boggles at the thought! Air is a fluid, and like any fluid it wants to flow from high pressure to low pressure. This leads to the “highs and lows” depicted on your TV weather forecast. Like water, air wants to flow along the path of least resistance, so any obstacles or other flows encountered would lead to ripples and eddies, or in conflicting flows to crashing waves. In essence, light turbulence would cause ripples in your coffee, moderate would make you spill your coffee and severe would send your coffee all over the ceiling. We would describe turbulence as moderate when equipment starts moving around and as severe when items dislodge and people are injured. Forecasters can usually predict the areas where turbulence could be expected, but unless we have convective activity with water and ice particles reflecting on our weather radar, pilots cannot see it coming – so clear air turbulence (CAT) usually becomes apparent only once we’re in it. On the day of this particular encounter Cape Town experienced a massive frontal storm, resulting in north-westerly surface winds of 27 knots gusting to 47 knots at the time this aircraft flew the approach. (That’s 50 – 87 km/h). This would equate to a crosswind component varying between 23kts to 41kts on runway 01. The B738 crosswind limit on a wet runway is 25kts – with the scimitar winglets a max of 15kts is recommended. However, with the visibility and cloud-base allowing, a circling approach with a landing on runway 34 could be considered (bringing even the gust into the allowable crosswind limit) and a number of aircraft reportedly did land on 34. All this tells us, is that it was clearly a challenging approach with rapidly changing conditions causing some severe turbulence once below 5000ft. Winds over the Cape peninsula have their own very unique characteristics, with the upper winds almost always very strong westerlies and the lower winds affected by the mountainous terrain. (The well-known Cape south-easter in summer, for instance, is usually a purely low-level phenomenon below 5000ft.). So the wind conditions on descent could vary dynamically – quite easily causing turbulence, especially in the vicinity of the thunderstorms present at the time. This is the nature of AWOPS (All-Weather Operations) which calls for flights to be conducted under all possible weather conditions. The rider is of course that all conditions must be understood, briefed, prepared for, and the go-around or diversion plan must be in place. So I am quite sure that the passengers on this particular flight were not in any danger at any time – very uncomfortable, yes – but not in jeopardy. Passenger video recordings (now in the public domain) show one or two big jolts and some changes in the aircraft attitude, due to the changing wind speeds and directions. What is concerning is passengers clearly not adhering to safety instructions. Seatbelts not tightly fastened, children being passed around and sitting on laps, cellphones being used – clearly no understanding of how that cellphone or tablet could become a missile if you let go of it – the list continues…. (Remember that this is in the last ten minutes before landing, with the cabin secured and passengers supposed to have turned off all electronic devices). Video Here. By the way, I flew the aircraft concerned two days later and found the event described in the technical logbook as “severe turbulence” experienced for a short period. The aircraft was inspected as required and found to be completely serviceable and safe. Turbulence in the air is a fact of life, just as ships will roll and pitch in high seas, or your car will rattle and shake over rough gravel. As pilots, we try to avoid or mitigate it as much as possible, by avoiding forecast areas, descending or climbing, or even slowing down to the recommended turbulence penetration speed. Turbulence is also forecast to increase in intensity. Scientists advise that, due to climate change we could expect natural events to become more isolated, of shorter duration and much more intense. 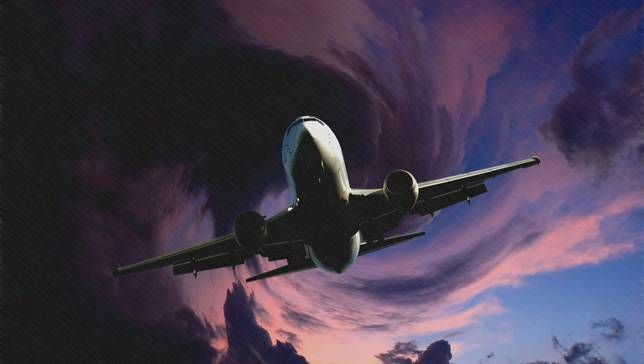 A recent study by Paul Williams of Reading University, published in the journal Advances in Atmospheric Sciences forecasts that severe turbulence events could increase by 149% over the North-Atlantic routes – I’m quite sure that the same could be expected locally. If turbulence worries you, my advice would be to check the weather forecasts before you fly: Should thunderstorms and high winds be possible, change your flight to another day. Once a strong front starts moving from west to east over South Africa, you could expect high winds and possible turbulence aloft. In summer, fly in the morning! But more importantly, listen to the Captain’s briefing and adhere to the Cabin Crew’s instructions. The illuminated seat-belt sign is not a signal to get up and visit the toilet! Should you experience some unnerving turbulence, be assured that the crew will do everything possible to alleviate the situation and that the aircraft is built strong enough to take severe turbulence in its stride. Aftermath of a turbulence encounter: Singapore SQ308, June 2013. (Pic: @Alan Cross via Daily Mail). Is there strong cross winds in the soecific area ?